Tooth loss is extremely common in adults, particularly with those who haven’t maintained a good standard of dental hygiene in their youth. Historically there were essentially two options when it came to missing teeth – live with them or get dentures. Thankfully there are more options than ever available to those looking to fill these gaps in their smile, from procedures like dental bridges for filling individual spaces or full mouth dental implants to completely replace a full set of top and bottom teeth. If you’re missing a full row of teeth, either at the top or bottom of your mouth, your options are a little more limited. Dentures have been used in the past to replace full rows like this, but modern implant technology known as ‘All On 4’ implants can permanently fix a full set of teeth to the jaw, replacing your old teeth in the most realistic way possible. 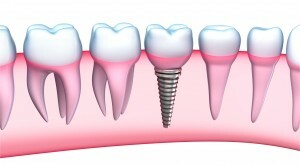 This type of dental implant relies on four dental implants to hold a denture in place. Two are traditional implants and are placed near the front of the jaw, while the remaining two are longer implants designed to fit into the rear jaw. The four structures fitted in the patient’s mouth are strong enough to support a full row of teeth, making it quicker and less invasive than having individual implants. The procedure often requires only one visit to the dentist, which is why they are sometimes known as ‘teeth in a day’. 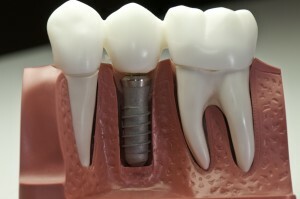 The ideal candidates for this type of implant include patients who want to do a complete arch replacement and are uncomfortable wearing traditional dentures. The only downside is the expense, which will far exceed the cost of traditional dentures. They should last a substantial period of time if looked after properly, and many people see them as an investment rather than an expense. Traditional dentures are the standard removable plates which many people are given when they are missing multiple teeth. They have been an effective method of tooth replacement for decades and are used by millions across the world who are missing teeth. The main reasons for choosing dentures are that they are effective and relatively inexpensive when compared with the alternatives. They are easy to maintain and if they are damaged or lost they can be replaced fairly quickly. Many people find them uncomfortable to wear for long periods of time, and they can prohibit wearers from enjoying some kinds of foods. The choice between All On 4 implants and dentures really comes down to cost and personal preference. Some people are comfortable with their dentures and would rather not spend the money on a replacement. For others, All on 4 offers a way of restoring a full row of teeth and living with a more natural smile.